Coll. No. 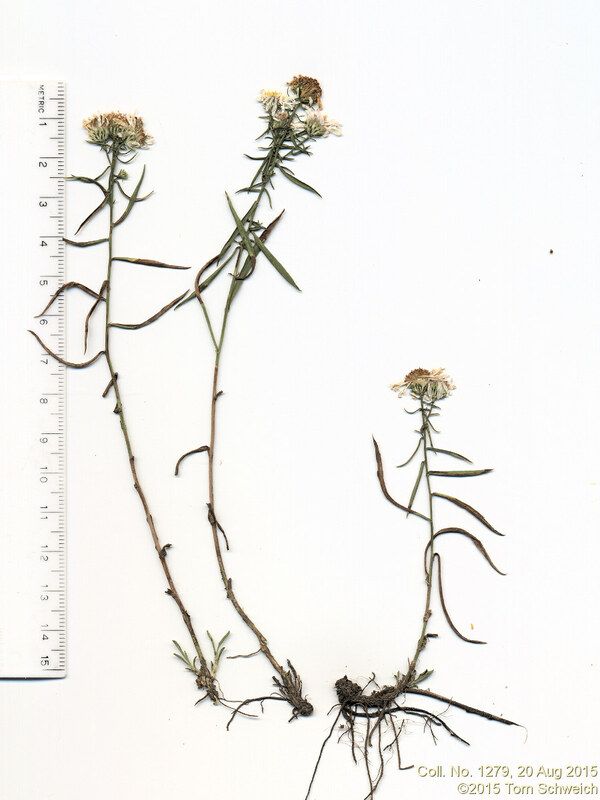 1279, 20 Aug 2015, characters observed: Perennial herb, to 25 cm., ascending, spreading by rhizomes and rooting stems, generally glabrous, except as noted; Leaves, alternate, cauline, lower leaves shriveled at flowering, largest mid-cauline, 28 mm. × 2 mm., reduced above, lanceolate, revolute, margin entire, tip acute; Inflorescence, cymose, single heads on short pedicels; Involucre, 6 mm. × 8 mm. wide; Phyllaries, 3+series, ±equal, 3 mm. × 0.4 mm. wide, imbricate, bases chartaceous, tips, green, acute, margins very lightly ciliate; Receptacle, convex, epaleate; Flowers of two kinds; Rays, fertile, corolla, 12 mm. × 0.7 mm. wide, white; Disk flowers, corolla, 3.3 mm., light yellow; Pappus, bristles, 3 mm. ; Cypsela, 1 mm., sparsely hairy. Field Notes: Coll. No. 1279, 20 Aug 2015.